Streamlined UI: Updated and streamlined interface for a more intuitive, user-friendly workflow. Hybrid Rendering: V-Ray GPU running on NVIDIA CUDA can now take full advantage of all available hardware, including GPUs and CPUs. Faster scene export: With our new optimizations and smart caching, translation and rendering of complex scenes is now up to 4 times faster. Asset Browser: The new Asset Browser now includes materials and proxy objects, and allows you to select and edit multiple items at once. Filter maps by linked files: Filter materials from linked projects separately from project materials. Improved Color Material: The Color Material now includes options for transparency, glossiness and reflections. Global Material Overrides: Improved user interface with new option to override RPC materials. V-Ray Proxy objects: ArchVision RPC objects can be used as stand-ins for V-Ray proxy objects in your Revit scene to render high resolution models of trees, cars, people and other entourage. Infinite Ground Plane: The Infinite Ground Plane includes new global override controls, an improved UI, and is supported in interactive rendering mode. AutoGen materials: AutoGen materials are now supported in interactive rendering mode. Improved Settings sharing: A new UI makes it easy to share settings between projects and users, including importing settings by category. Improved Standalone Material Editor: A new color picker, and new gradient and color temperature texture maps have been added to the Standalone Material Editor. Improved V-Ray Frame Buffer: Copy the entire frame buffer image to the clipboard, including background and color corrections. Design-friendly interface: Quickly balance quality and speed with V-Ray for Revit’s render presets. Work in draft mode for early iterations and switch to high quality for presentations. Physically-based Lighting: Accurate options for IES and HDR image-based lighting, as well as support for Revit Sun and Sky. Adaptive Lights: Fast new lighting algorithm that can cut rendering time by up to 7X in scenes with many lights. Real-world Cameras: Simulate photographic cameras from Revit’s native camera views. Physical Materials: Automatically convert Revit materials to V-Ray’s physically-correct format. Fine-tune material properties using the V-Ray Material Editor. Material Library: Over 500 high-quality architectural materials — compatible with V-Ray for 3ds Max, Rhino and SketchUp. Diagrammatic Materials: Easily make scenes look diagrammatic or like a scale models with material presets such as basswood and foam core. Section boxes: Render sections easily with full support for Revit’s native section boxes. Denoiser: Automatically removes artifacts and noise, cutting render times with GPU-accelerated denoising. Aerial Perspective: Add realistic atmospheric depth with aerial perspective and environment fog. V-Ray Frame Buffer: Fine-tune your render’s color, exposure, and more directly in V-Ray’s frame buffer. Material ID Render Element: Mask individual objects for easier compositing in Photoshop or your favorite image editor. Virtual reality: Verify designs at 1:1 scale in popular VR headsets like Google Cardboard, Samsung Gear VR, Oculus Rift and HTC Vive. V-Ray Swarm: Web-based distributed rendering to speed up rendering by using the power of all available desktops and render nodes. 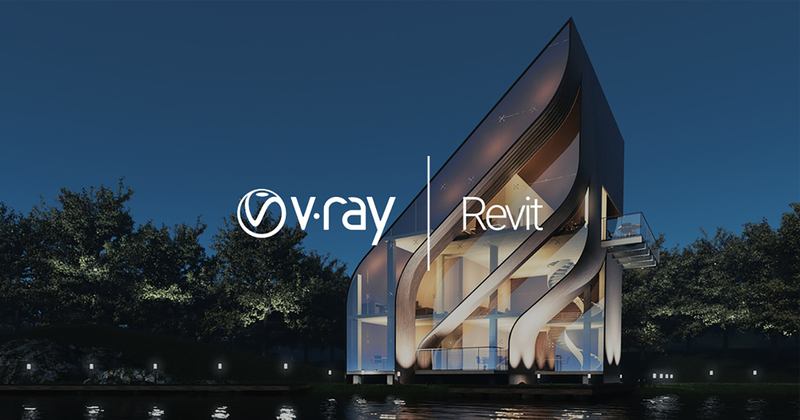 Export to V-Ray Standalone: Export a ready-to-render scene from Revit to V-Ray Standalone.